Belle's Magical World, retitled Beauty and the Beast: Belle's Magical World in the the 2003 re-release, is a 1998 Direct-to-Video midquel of Disney's Beauty and the Beast. It is also a sequel to the previous midquel Beauty and the Beast: The Enchanted Christmas. The film takes place partway through during the original film. It's a Compilation Movie featuring various connected shorts. The original film consists of the shorts "The Perfect Word", "Fifi's Folly", and "The Broken Wing". The 2003 Special Edition re-release adds "Mrs. Potts's Party". Interestingly, these shorts are actually unreleased episodes of a cancelled Beauty and the Beast TV series. Compilation Movie: The film consists of four (originally three) shorts. 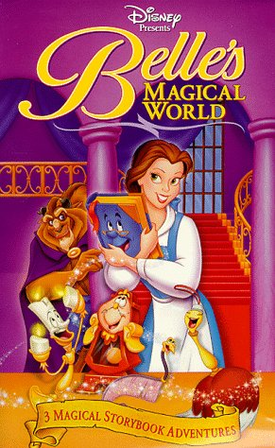 Covers Always Lie: The 2003 DVD cover showed Belle wearing her yellow ballgown, even though she never does so in any of the shorts. A Day in the Limelight: "Fifi's Folly" and "Mrs. Potts's Party" are based around the castle staff. Named by the Adaptation: The feather duster is named "Fifi". Sudden Name Change: The Broadway musical gave the feather duster the name "Babette". Here, she's "Fifi". Off-Model: Given that the film is a compilation of four (previously three) unreleased shorts that were originally planned for a cancelled TV series, the film has low quality animation akin to a television cartoon, not a Disney direct-to-video cartoon (or even the quality of an average Disney television cartoon). At one point Belle's eyes go in different directions.